The Western Bulldogs won their first premiership in 62 years (only their second overall) on October 1st in the Australian Football League. As 62 is my age, I know how long a time it is! During the pre-game build up show on TV I was reading all the sport in the local papers. I was also looking at my notes in preparation for writing my Amazon review of '64 shots - leadership in a crazy world' by Kevin Roberts. What was jumping off all pages for me was what happens in sport, business, and life in general, when people truly care for one another. Then I noticed a close in camera shot in the change rooms of Western Bulldogs coach Luke Beveridge with his players. I remarked to my wife, he truly loves his players, and they him and each other. This was obvious throughout the game, and even more so when the final siren sounded. "To get commitment in any space, give people love. It's a surprisingly obvious thought, rare in business, but the fastest way to grow." During my study of '64 shots' I went back and reviewed Lovemarks, the 2004 published book that makes my top 21 recommended reading list. The sub-title of this book, also by Kevin Roberts, is 'the future beyond brands'. Brands are owned by companies. Lovemarks are owned by people. Brands are created by respect. 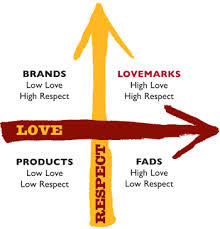 Lovemarks are created by respect and love. Brands mean loyalty for a reason. Lovemarks mean loyalty beyond reason. 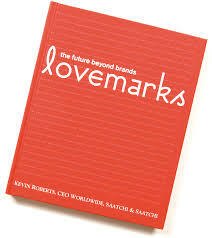 Brands aim to be irreplaceable, lovemarks irresistible. Brands seek return on investment, lovemarks return on involvement. "Not price, not value, but priceless value. Priceless value responds to the emotional question on lips today. "How will you improve my life?" Brands have no answer to this. Brands used to be irreplaceable. Nothing is irreplaceable now. People can replace anything from anywhere. You have to be irresistible, a lovemark." Being/becoming a 'lovemark' is the future of your business. Co-building a 'lovemark' is our BHAG (Big Hairy Audacious Goal) at The Appreciative Leader Community. Our limit is 150 members. There’s a one page summary of how you can become 1 of the 150 with links to the detail here. The Appreciative Leader Community is for lovers of leadership learning, unlearning, and relearning, creating more leaders, and leaving a lasting leadership legacy. "A leader asks this question when the sun rises: what will I leave behind?"